Does anyone know about this Japanese restaurant in Lincolnwood? Good, bad or otherwise? Your answer is in this thread. It is deep down so do scroll, it is there. Renga-Tei is, as other threads have noted, a very pleasant, highly competent, old school Japanese restaurant which gave the impression at lunch today of serving every elderly Japanese-American in the north suburbs. Except for the Japanese nationality of the majority of the patrons, the vibe was exactly like a Sunday morning at Walker Bros., or a Saturday night at Myron and Phil's. I wanted to ask the (rather harried) waitress, "What's the Japanese for 'What'll it be, hon?'" Had yet another very nice meal at Renga-Tei this evening. Nothing fancy or flashy, not a sak-i-tini in sight. Had a couple of, new to me, appetizers, deep-fried filets of Horse Mackerel (Aji), which were crisp, greaseless and very flavorful, and a couple of nigiri of Taira Gai. When I inquired as to exactly what Taira Gai was, aside from very good, I was told clam, then scallop and then large scallop. The flesh tasted like a scallop, had striations, like a scallop, but was much denser. Not chewy dense, like Geoduck (Mirugai) or Red Clam (Aoyagi). ........Ok, a minute or two on Google and it seems Taira Gai (Torigai) is Japanese cockle. Renga-Tei also had White Cockle on it's specials menu, though two lines under Taira Gai. I wonder if this is the same thing and the person writing the specials menu made a slight error or they are two different things. G Wiv wrote: ........Ok, a minute or two on Google and it seems Taira Gai (Torigai) is Japanese cockle. Renga-Tei also had White Cockle on it's specials menu, though two lines under Taira Gai. I wonder if this is the same thing and the person writing the specials menu made a slight error or they are two different things. Torigai is one of my favorites. It used to be available at many more places in the past, but in the last several years, it has been harder and harder for me to find. In fact, I've pretty much given up asking for it. Now that I know I can get it at Renga-Tei, I'll get over there soon. I really like that place as a less expensive, more basic alternative to Katsu when I'm not in the mood to drop a C note at dinner. Recently, the Petit Pois and I had a heck of a meal at Renga-Tei. It was so good that I'm going to have a hard time going anywhere else when I'm looking for Japanese food in the low-moderate price range. As soon as we walked in, the words "Katsu Curry" caught my eye on the specials menu and my mind was made up. Before the entrees , we shared an order of goma-ae which was nothing short of extraordinary, not only for the delicious sesame dressing, but for the perfectly steamed and formed spinach. Every place seems to have their own spin on this dish, and Renga-Tei's is my favorite, by far. I also snuck in a spicy tuna hand-roll, which I was pleased to find had the perfect balance of excellent fish and spicy heat. Too often this is a lopsided piece of sushi, but this one hit the mark perfectly. For my katsu curry, I expected the katsu to be served covered in a thick curry sauce with some rice on the side. What I got was the katsu and rice on one plate and a separate bowl of a curry beef stew. I was also presented with two large spoons, one of which was large enough to paddle a boat, and made of wood. Having not seen this before, I inquired with our waitress about the spoons. The large wooden spoon is for bringing the sauce to the katsu, the regular spoon is for eating the stew. It made sense enough for me to play along. The katsu cutlet was delicious: crispy, juicy, and flavorful on its own. The curry sauce was probably slightly thicker than I like but it had an addictive flavor that I couldn't get enough of. I didn't care for the contents of the stew as much; sinewy beef and over-cooked carrots and potatoes. When another waitress walked by and saw me eating the curry sauce from the stew bowl with what I thought was the proper spoon, she had a hearty laugh. "You like the curry? ", she asked. "What's so funny?" I politely asked. "You eat the curry from the bowl. You must like it very, very much." So, I think I learned that the bowl is not for eating from. It is rather a containment vessel which you should use the wooden spoon to remove the stew to the rice or katsu before eating with the other spoon. My bad. The Ms. ordered, to both of our surprise, the salmon teriyaki, a dish that I don't think she has ever ordered. I generally shy away from teriyaki due to the fact that I find it too often to be too cloyingly sweet and unenjoyable. This dish was delicious with layers of flavor from the sauce and the fish, none outweighing the other. On my way out, the laughing waitress followed me to the door to ensure me that Renga-Tei serves curry rice every Friday for lunch and if there's more left for dinner the katsu curry should be on the menu. I'll be back for more. eatchicago wrote: goma-ae which was nothing short of extraordinary, not only for the delicious sesame dressing, but for the perfectly steamed and formed spinach. Every place seems to have their own spin on this dish, and Renga-Tei's is my favorite, by far. I wholeheartedly concur on this. 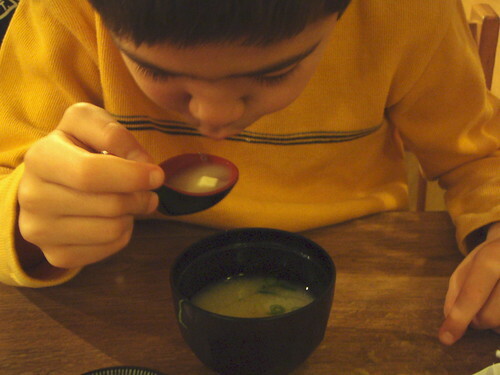 I order goma-ae practically every time I eat Japanese and Renga-Tei's makes a perfect version. I've enjoyed everything I've eaten at Renga-Tei, from excellent sushi to well-made cooked food. They also do lovely, greaseless tempura and a particularly nice regular tonkatsu, best I've had in Chicago except for Takkatsu(still not reopened). I agree that the goma-ae is the best in town, with the one exception of Katsu, which makes the best version of this dish I have ever had anywhere. As I have posted before, I think Renga-Tai is a great mid priced sushi destination. my bowl of katsudon last nite.. was.. THEE biggest, overwhelming, fulfilling bowl of pork cutlet i've ever had. it was just a beautiful beast with perfectly simmered onions and pounds of tonkatsu. we chatted up the nisei (probably?) seniors next to our table. they could not get over their non-present son "Brian's" addiction to the same dish i was having and joked about the kitchen's delay of my order. after that, we talked to the neighboring Filipino couples about their recent trip to Makino's in vegas and how meek Todai compares... fabulous! Has Renga-Tai closed? I drove by a week ago on my way to Wholly Frijoles and it looked dark at dinner time. IF it was Tuesday, then yes it was closed. Upon checking my calendar, it was Tuesday, February 20. After collecting my gardening supplies Sunday, Sparky and I were looking for a nice lunch and discovered that almost this entire corridor (including Wholly Frijoles, DongAh grocery, and Schlegl's bakery) are closed for lunch on Sunday. I like Mike G's analogy to Walker Bros. It is definitely the most kid friendly Japanese restaurant that we've visited, and I think that combined with price and food quality make it tough to beat in our book. The curry is indeed good enough to eat out of the bowl, and they once ran a broiled snapper collar special that was a slice of heaven. Unfortunately, I never saw it back after that one time, but it's high points for me are the family-centered environment and those surprise specials. As a backup, I think they always have hamachi kama, broiled yellowtail collar, which I enjoy very much. Yesterday evening, I picked up Cookie from a business trip where she ate nothing enjoyable. So, dinner was her choice (as long as it didn't involve me cooking). She wanted something simple and home-y with little or no wait for a table and no place that required her to change clothes before leaving. Hashalom is closed on Sunday evenings, so Renga-Tei met all of her needs. I've been a regular at Renga-Tei for a couple years now and my ordering style generally falls into one of two categories: a bunch of sushi or pork and rice. Last night I really couldn't make up my mind and I stumbled upon what I think might be the best deal on the menu: The $18.95 Combination "D". -Plain rice and plenty of shredded and grated daikon. Really an excellent, varied meal for a reasonable price. Next time I may ask for sushi rice instead of plain rice so I can have chirashi instead of sashimi. The only disappointment of the evening is that they were out of the excellent house-made orange jello. Had a lovely, lovely dinner at Renga-Tai last night - a very comfortable place to take the family...we were surprised to find that at 5:30 on a Sunday, we got the last table in the place and shortly thereafter the little waiting area was packed. The demographic is interesting - for me, a barometer of an ethnic restaurant is to see if the crowd reflects the menu. Renga-Tai's crowd is, indeed, mostly Japanese but the remaining clientele appeared to be average joes and not foodies, which I took as a good sign. It's a fair-size menu, a lot to choose from - so we started with an order of edamame, beef and asparagus rolls, the "Super-crazy Chicago Roll" (I couldn't resist the moniker) and a Shrimp tempura kids meal for Sparky. 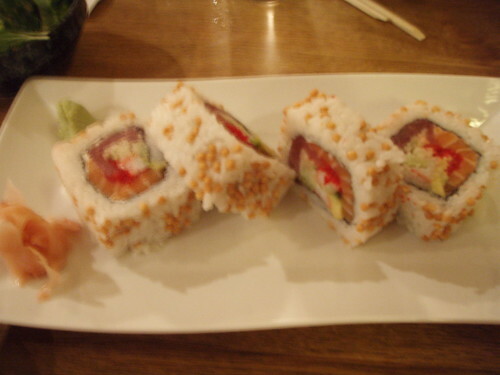 And the apps arrived, right on time (the pacing and service were very good for a small, busy Mom and Pop place) The picture doesn't do it justice: this roll was, indeed, the super-crazy size of Duplo blocks - but they were good. The little brown bits on the outside were some kind of salty rice krispie, which offered a nice crunch - inside were several kinds of fish and veggies that went together well (IIRC salmon, tuna, cucumber, avocado and tobiko ) We had to fight Sparky for the last one. 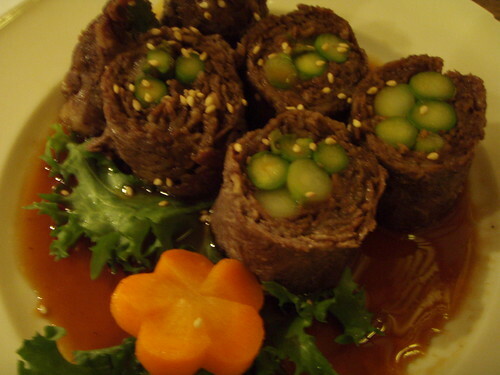 Beef-Asparagus rolls were yummy, kind of like an Italian Beef wrapped around perfectly steamed asparagus; the sauce was salty and gingery and had just a hint of sweetness. 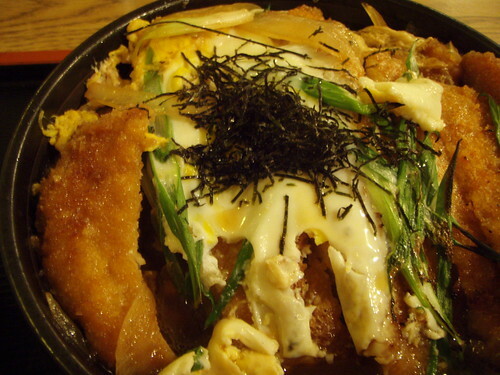 The 'spouse had the Katsu-don, yummy - he likened the rich sauce on the bottom to a good french onion soup. I had Ikura-Udon with shaved radish and forgot to snap a photo; it was good but difficult to eat as the little fish eggs kept escaping me by swimming around the broth. We opted for the cheesecake for dessert, and the waiter was kind enough to warn us that the jelly was made with wine and might not be appropriate for Sparky. It's a light, refreshing dessert - almost, but not quite, entirely unlike cheesecake. Sparky liked his mango sorbet and our meal ended with little floral Japanese candies. We've been meaning to go for a long time, and I'm glad we did. I'd recommend making reservations, though! Thank you for the excellent report and pics Mhays. Me and the B are now even sadder that we could not join you. Hopefully next time! Even more of a bummer for Sparky - he has quite the crush on B! Well, next time I'll give more notice! Forgot to mention - Sparky was thrilled to discover that they will make Inarizushi and wolfed the entire thing down before we could reach for the camara. Evanston sushi bars don't tend to carry it, which is a shame because it's particularly kid-friendly. It's similar to egg or Tamago sushi in sweetness, but it has a texture remeniscent of the coating of something batter-fried - if your kids eat food only in nugget form, this might help them branch out a bit. eatchicago wrote: Last night I really couldn't make up my mind and I stumbled upon what I think might be the best deal on the menu: The $18.95 Combination "D". There are nine very good pieces of sashimi there. The sunonomo (in a bowl) and pickled cabbage are on the far right. All of this food comes after an included bowl of miso soup and a house salad. eatchicago wrote: The only disappointment of the evening is that they were out of the excellent house-made orange jello. Not tonight. There was plenty of jello to be had. This dessert, introduced to me by nr706, turned Renga-Tei from being a pleasing neighborhood spot into a comforting regular spot for me. Did I mention I really love this jello? These days, "Combo D and Orange Jello" is firmly entrenched in my regular comfort food repertoire. Thanks for the post and wonderful pix, Michael. I feel somewhat vindicated by your particular mention of the jello. I singled out when I reviewed Renga-Tei long ago and have been the consistent object of hilarity for my simple taste. But I persist: that's the best jello you'll ever have. Makes the boxed stuff seem artificial by comparison. Gypsy Boy wrote: I feel somewhat vindicated by your particular mention of the jello. I singled out when I reviewed Renga-Tei long ago and have been the consistent object of hilarity for my simple taste. But I persist: that's the best jello you'll ever have. Makes the boxed stuff seem artificial by comparison. I've never gone for it, but it's high on my list of new things to work on. To those who haven't had the Renga-Tei jello, it's an orange jello (made with orange juice) and has sliced pears in it, which give it a little texture and flavor balance. If and when you do the homemade gelatin, then may I suggest you go to the Home Economist for bulk gelatin? It is far cheaper than the Knox with the little packets you need to open. At one time each packet was a tablespoon of gelatin, which is no longer true. I bought some Knox at the last minute, had an older recipe calling for a packet and just threw it in. It didn't set right because there wasn't enough gelatin. Does anybody remember the homemade orange jello that the made at the dearly departed Nagano, a noodle shop by the owners of Matsuya on the 3400 block of North Clark that closed several years ago? It actually arrived quivering in sections of orange peel, just like a real cut up orange. Except that the flesh was replaced by jello. Amazing! The Chow Poodle and I had a lovely dinner at Renga-Tei last night. The fish was very fresh and the selection was, if anyting a bit broader than normal. In particular, the amberjack (kampachi) was very good! As I was leaving, I noticed that they had already posted their new renewal GNR Certificate next to the front door with a small copy of the original certificate beneath it. It did my heart proud to see those certs displayed in such a prominent manner. Steve, I will second that wonderful amberjack kudos, which has been a sushi special at Renga-Tei for a few months now. Renga-Tei, and Koto (which was in the same building before that) turned me on to Japanese cuisine starting in 1980. But even before that, I did work as a busboy, then parking attendant at the teppan-yaki style Tanikaze Steak House on Lincoln Ave., the same building at which Via Veneto now resides. What a freak show that was! Great food, but us bus boys were treated as fourth-class citizens during most of the time--I even learned all the Japanese curse words, because they were usually directed at us! The only saving grace was at the end of the night when we'd be able to dine with the chefs & owner on homemade sukiyaki and cold draft Kirin beer. That was a 'high-porch picnic' when you're 17! One of my best buddies is of Japanese descent, and he and his 84-year-old mother swear at Renga's authenticity. I'm treated like family there, but he's royalty! jnm123 wrote: One of my best buddies is of Japanese descent, and he and his 84-year-old mother swear at Renga's authenticity. I hope you mean "swear to." Mike G wrote: Renga-Tei is, as other threads have noted, a very pleasant, highly competent, old school Japanese restaurant which gave the impression at lunch today of serving every elderly Japanese-American in the north suburbs. Except for the Japanese nationality of the majority of the patrons, the vibe was exactly like a Sunday morning at Walker Bros., or a Saturday night at Myron and Phil's. Definitely don't want to give the impression that the Japanese person is prone to swearing. Mr. X and I had a very nice meal last night at Renga-Tei. We've learned that the main dinner rush ends around 7:30, so we timed our arrival to avoid waiting. Taking eatchicago's recommendation, I tried Combination Dinner D and was quite happy. Mr. X had Combination Dinner A (shrimp and vegetable tempura, chicken and steak teriakyi, steamed vegetables, plus the miso soup and salad.) We had never tried the orange jello so we gave it a shot. It was as delicious as promised. I do have to sheepishly admit that I've never had sashami. I've had nigri and maki so it's not like I'm new to the whole thing. I was somewhat confused as to how I was supposed to eat the fish and rice. Any tips? The GP wrote: Mr. X and I had a very nice meal last night at Renga-Tei. We've learned that the main dinner rush ends around 7:30, so we timed our arrival to avoid waiting. Taking eatchicago's recommendation, I tried Combination Dinner D and was quite happy. Mr. X had Combination Dinner A (shrimp and vegetable tempura, chicken and steak teriakyi, steamed vegetables, plus the miso soup and salad.) We had never tried the orange jello so we gave it a shot. It was as delicious as promised. 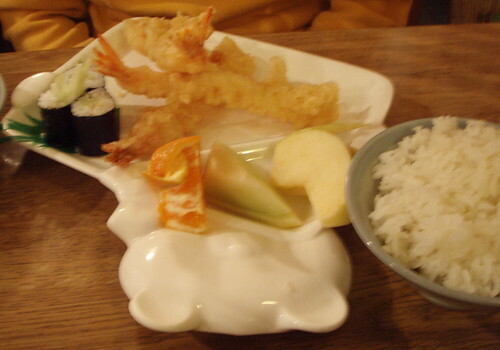 Since your bowl of rice is likely plain short-grain rice (vs flavored sushi-rice), it is there to accompany the other items on your combination tray, like the tempura and pickles. The sashimi is eaten as is - dipped in your condiment of choice (soy or soy & wasabi).